All transactions are safe and secure with a reliable history in online purchasing behind each of our associates. 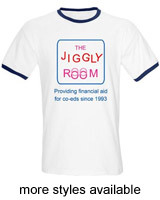 Buy the Married With Children Jiggly Room t-shirt to own Married with Children clothing and merchandise. We all love watching Al with his gooney friends, whether they're discussing the latest issue of Big 'Uns or hanging out at The Jiggly Room, advertised here. Al represents the overworked male, especially when you factor in Peggy's marital requirements. Celebrate the show and join Al's bandwagon by grabbing this tee today. Wear it when your Al Bundy Polk High t-shirt is in the wash. In addition to the Married With Children Jiggly Room tee above, browse the Married with Children Clothing Gallery for more apparel like men's and women's clothes, kids shirts or hoodies.